A missing organ can result in severe effects on one's psychology, especially when it is a vital part of one's appearance. A missing eye invariably leads to physical, social, and psychological changes in a patient's way of thinking and self-confidence. Loss of a human eye can be a result of surgical procedures such as enucleation, evisceration, or exenteration which are aimed at treating malignancies, congenital defects, sympathetic ophthalmia, irreparable trauma, underlying infections, phthisical eye, etc. Enucleation refers to a complete removal of the globe along with a part of optic nerve and may or may not involve musculature. Evisceration, on the other hand, is a more conservative procedure that involves the removal of the intraocular contents of the globe, sometimes the cornea. 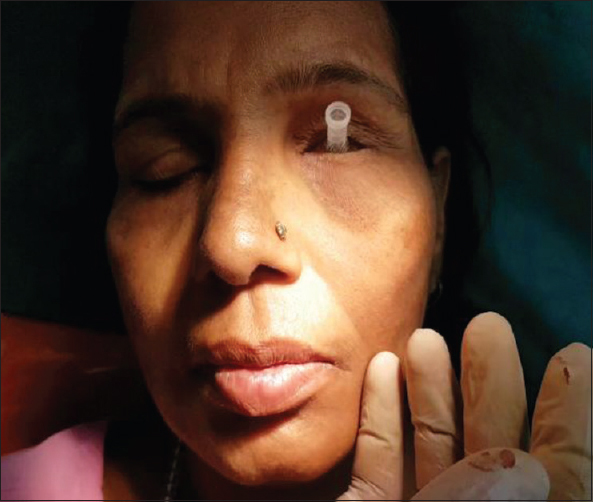 The enucleation procedure is commonly done under general anesthesia, but can be performed under local anesthesia with a retrobulbar block., To reduce the risk of some remaining cancerous tissue, a large portion of the optic nerve is also removed in some cases. However, there can be a significant risk of ptosis and extraocular muscle damage accompanied with this procedure because the optic nerve is transected near the orbital apex. 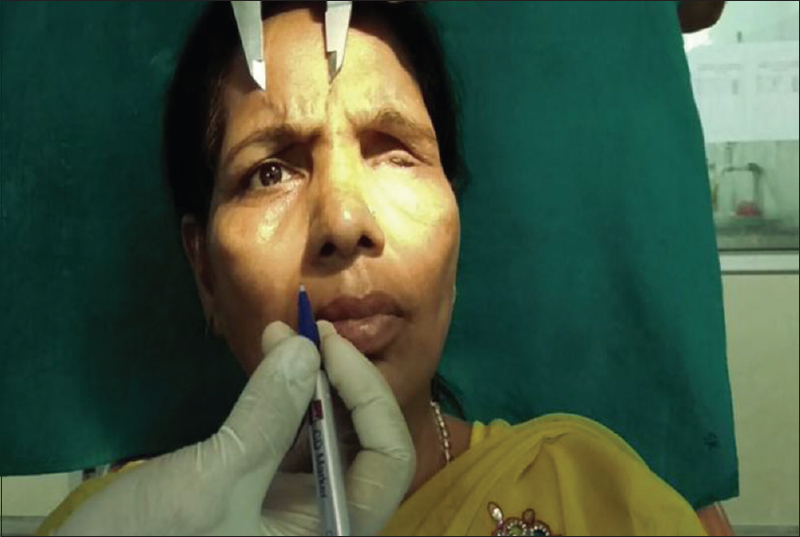 In evisceration, the internal aspect of the sclera is cauterized and treated with absolute alcohol to denature any residual proteins, decreasing the risk of sympathetic ophthalmia. 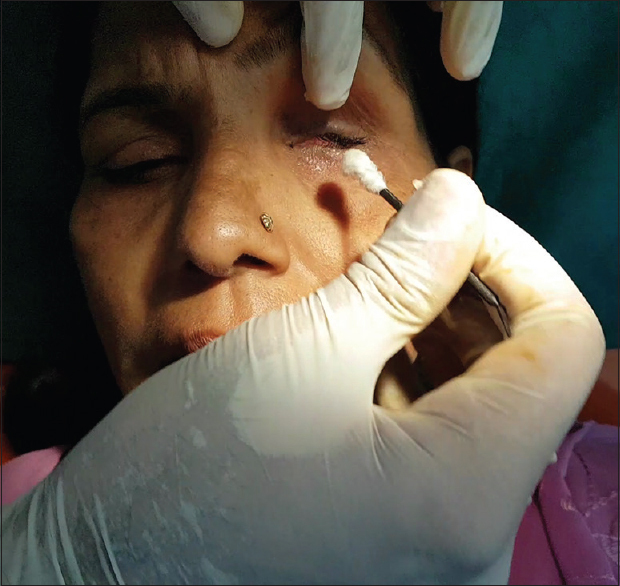 Orbital exenteration is a more radical procedure, and it implies the removal of the orbital contents including the periorbita and eyelids. However, sometimes, orbital tissue can be conserved, and eyelid skin and orbicularis muscle are spared. Exenteration surgery is necessary in cases of orbital and periorbital tumors, and occasionally other conditions, that are potentially fatal malignancies. Various methods and techniques have been used to fabricate a prosthesis that replaces the human eye. 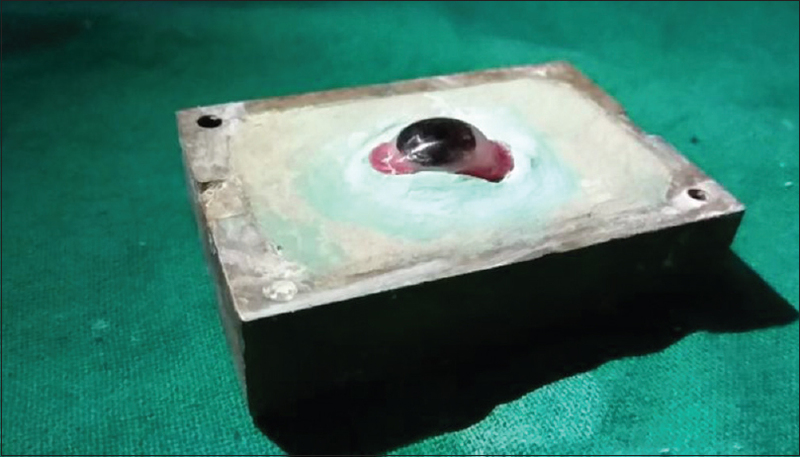 The following report highlights the use of a custom ocular tray and a stock iris shell to fabricate a semicustomized ocular prosthesis. 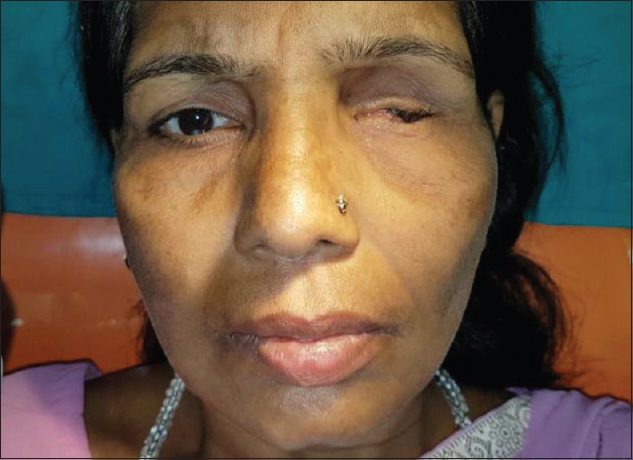 A 51-year-old female patient reported to the Department of Prosthodontics, Crown and Bridge, Divya Jyoti College of Dental Sciences and Research, Modinagar, with a complaint of a missing eye for 2 years that was a result of enucleation to treat varicella infection that spreads to the eye [Figure 1]. 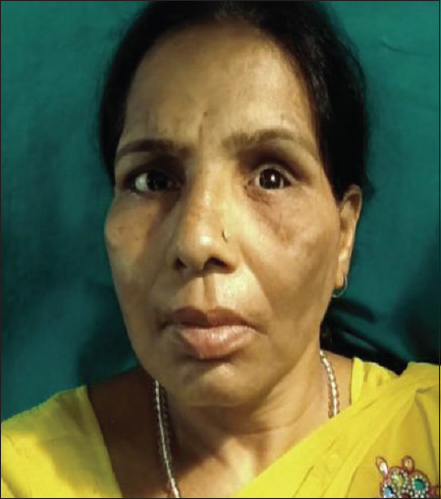 On further history taking, the patient revealed that she had been wearing a stock scleral shell for 4 months, but it was not satisfied in terms of the fitting. On examination of the socket, no signs of infection or inflammation were seen, and there was a healthy conjunctiva. The movements were satisfactory sideways and downward, but were not as satisfactory in the upward direction. 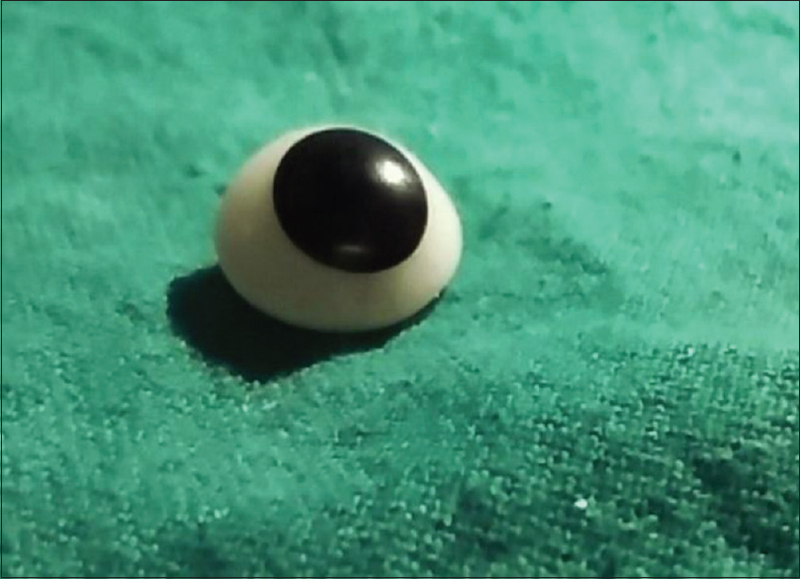 A semicustomized ocular prosthesis was planned using a stock iris shell and a custom made sclera and a custom-made ocular tray. The patient was thoroughly educated about the whole procedure. Trimmed sclera was replaced with a clear heat-cured polymerizing acrylic resin, and curing, deflasking, finishing, and polishing were done [Figure 13] and [Figure 14]. The final ocular prosthesis was delivered and postinsertion instructions were given regarding the usage and maintenance [Figure 15]. 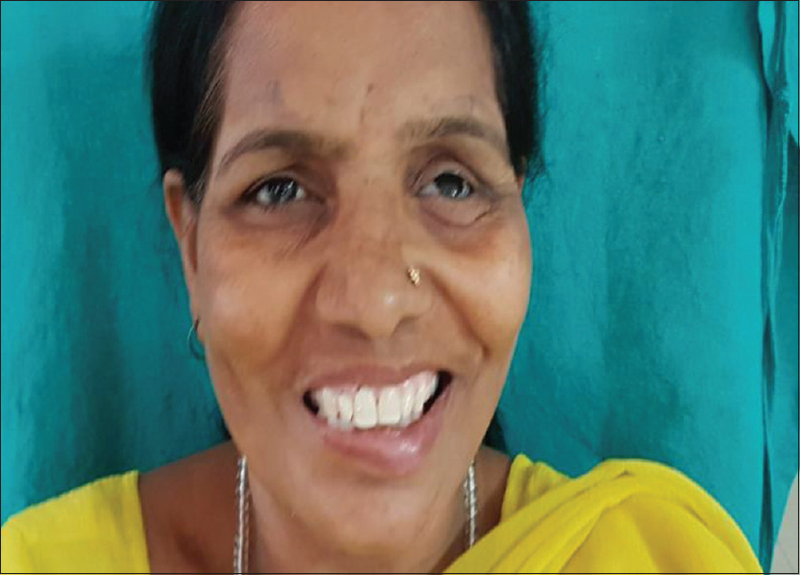 Customized ocular prosthesis has the advantages over stock eyes such as better contouring, color matching, and coordinated movements with the contralateral eye. Customizing the iris demands extra skill and time from the operator. This can be avoided if stock iris matching with the contralateral natural eye is available. Semicustomizing the prosthesis using the stock iris and customized sclera will have advantages of both stock and custom prosthesis. 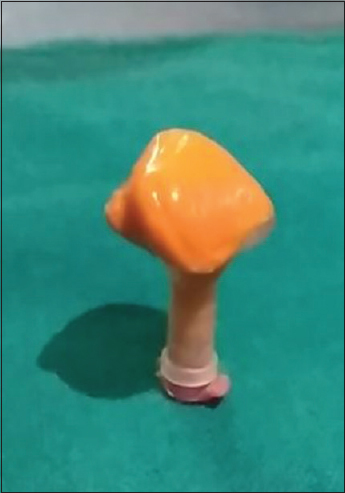 This technique is not advised when the color, contour, and configuration of the stock iris are not satisfactorily matching with the contralateral natural eye of the patient. 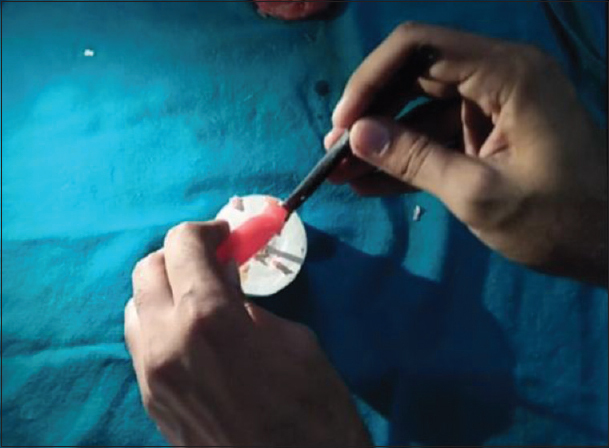 A semicustomized ocular prosthesis has been described that reduces the fabrication time by selecting a matching stock iris while a custom-made sclera maintains the esthetics properly. This prosthesis enhances the patient's comfort and confidence by increased adaptiveness and natural appearance and also maintains its orientation when the patient performs various eye movements. Putanikar NY, Patil AG, Shetty PK, Nagaral S, Mithaiwala HI. 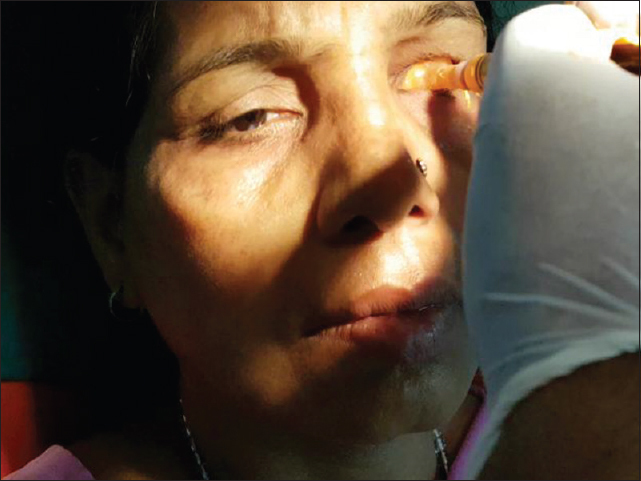 Prosthetic rehabilitation of a patient with ocular defect using semi-customized prosthesis: A Case report. J Int Oral Health 2015;7:81-4. Moshfeghi DM, Moshfeghi AA, Finger PT. Enucleation. Surv Ophthalmol 2000;44:277-301. 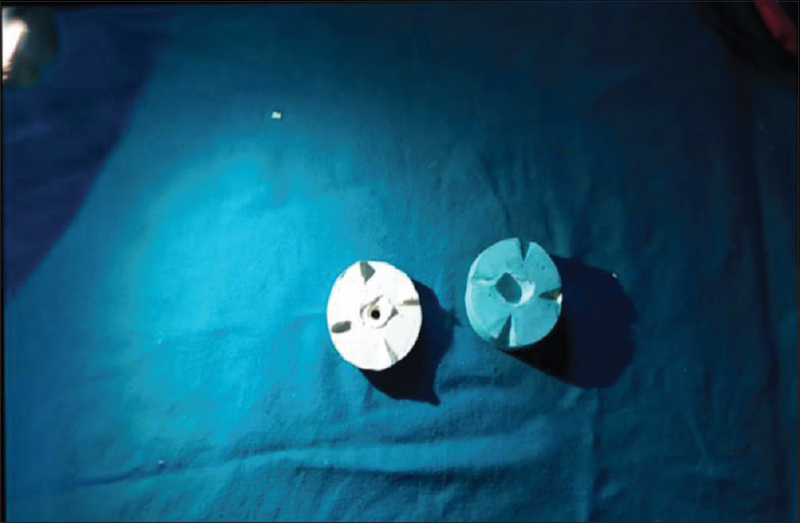 Morton A. Enucleation and evisceration. In: Thach AB, editor. 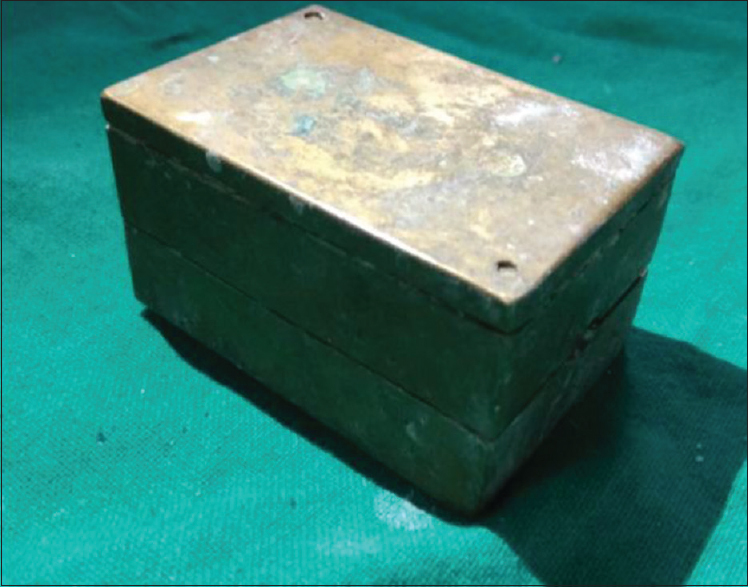 Ophthalmic Care of the Combat Casualty (Textbooks of Military Medicine). Washington, DC: Office of the Surgeon General at TMM Publications; 2003. p. 405-20. 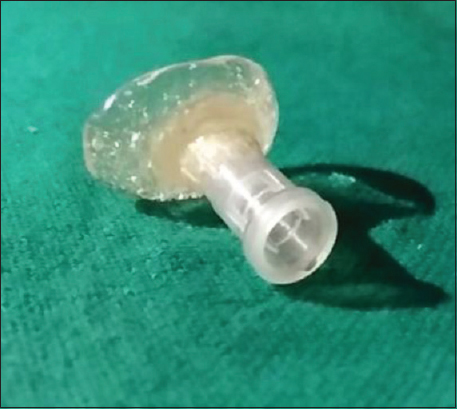 Singh KR, Chaurasia S. Ocular implants and prosthesis. DOS Times 2014;20:55-62. Chin M, Marques C, Danz H. Ocular prosthesis: Indications to management. Can J Optom 2015;77:24-32. Sykes LM. 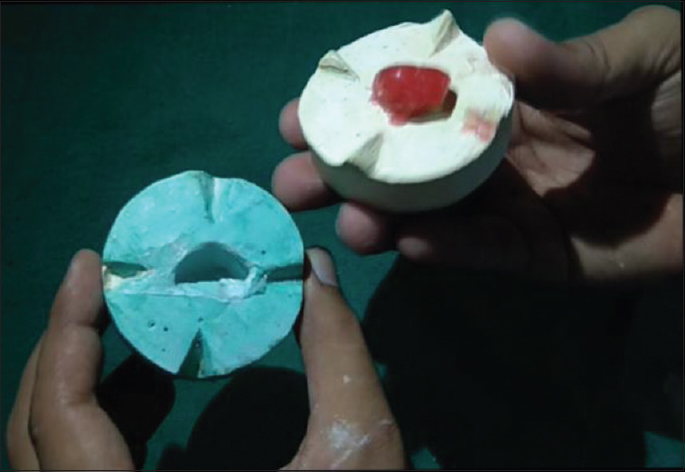 Custom made ocular prostheses: A clinical report. J Prosthet Dent 1996;75:1-3.